This is an experimental post...I feel like I have a lot of building crushes that I can start writing about so here goes. 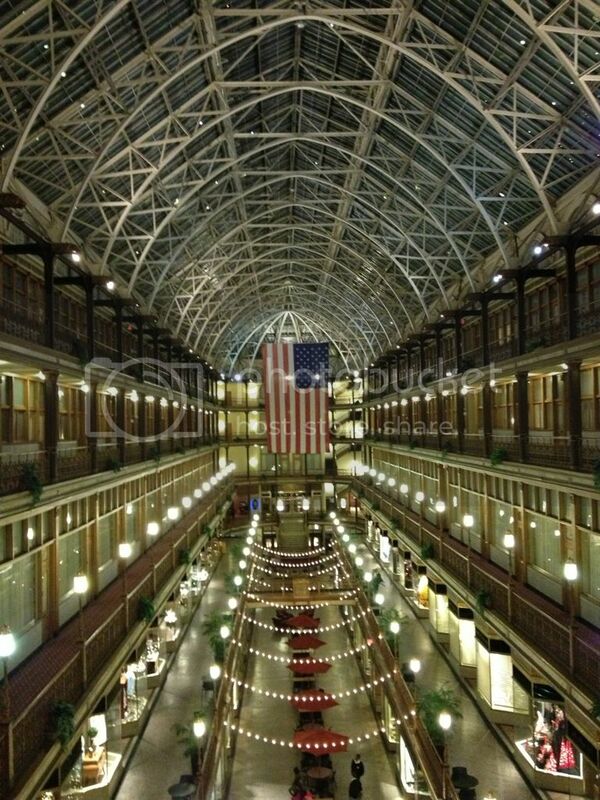 I stayed in the Hyatt Regency at the Arcade on the last night of my previously mentioned work trip in Cleveland. Pulling up to the building in my rental Passat (which I loved), I knew this was going to be different than the cheap box hotels that I had been staying in for the past few days. I hadn't really paid attention when I booked the hotel so I had no idea that it was a historic landmark. The massive structure was built in 1890 as the first large scale indoor shopping mall and the first skyscraper in Cleveland, designed by John Eisenmann. The building has a stunning interior view seen above. I didn't really know what I was getting into until I rounded the corner from the elevators on my way to my room and happened upon the series of trusses creating a huge skylight open to the ornate balconies over the arcade below. I couldn't find my iPhone fast enough. Man imagine that place on a sunny day! I was in Cleveland for less than 24 hours, but the hotel was centrally located downtown right across from the bustling pedestrian friendly 4th Street and not far from the lake. If I ever find myself in Cleveland again (will I? ), I would definitely stay here again. View more & better photos of the arcade here.